In two days with TapRooT®, you will learn how to conduct an investigation and develop effective Corrective Actions. A TapRooT® course is a career booster and has proven a professional game changer for many. TapRooT® is designed for learners at all levels. You will learn to find and fix the root causes of incidents, accidents, quality problems, precursors, operational errors, hospital sentinel events, and many other types of problems. Techniques include: SnapCharT®, Root Cause Tree® & Corrective Action Helper®. Upon course completion, attendees will receive a certificate and a 90-day subscription to TapRooT® VI, the online software service. Most importantly, you will have the advantage of professional training in your expertise and on your resume! We’ll meet at the Marriott on the Falls Hotel on June 20 for the 2-Day Root Cause Analysis Training course. You will likely want to explore a bit of Niagara Falls so we’ve included highlights of your host city. Register here to take the TapRooT® course in Niagara Falls. Three waterfalls bridge the international border between Canada’s Ontario province and New York state, forming the southern end of the Niagara Gorge. This is the roar of nature, adventure at its fullest. Take a Niagara Hornblower Cruise or cruise via Maid of the Mist close to the bottom of the mighty Niagara Falls and watch the wall of thundering water. Ponchos provided! Keep the thrills going on another wet visit as you descend an elevator to go through a narrow tunnel—Journey Behind the Falls. Get close up via a boardwalk. White Water Walk, along the Great Gorge, showcases Class 6 whirlpool rapids in the raging river. Insider tip: Prepare to get wet (and pack accordingly) for any of the boat adventures! Want a bird’s-eye view of the falls? 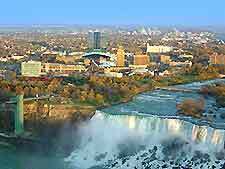 Go to the top of Skylon Tower, 775 feet above the falls. There are two fine dining restaurants at the top, a 3D movie theatre, and a Family Fun Centre. Niagara Gorge Discovery Center is a gateway into short hikes around the falls. Or try Niagara Glen Nature Centre to hike along the Niagara River. Niagara Adventure Theater is a 45-minute production about settlers, explorers, and the story behind the thundering falls—all within feet of American Falls, Bridal Veil Falls, and the Horseshoe Falls. Drive over the Rainbow Bridge, an arch bridge across the Niagara River gorge. Did you know: The Niagara River, along with the Great Lakes Basin, is a legacy of the last Ice Age. 18,000 years ago? Cycling is a blast here. Take the route along the 56 km path, Niagara River Recreation Trail, connecting Fort Erie to Niagara-on-the-Lake. The route may be started anywhere in the park. Fancy a wine tour and tastings in Niagara Falls? Two popular opportunities are Winery Tours of Niagara and Discovery Tours Unlimited. 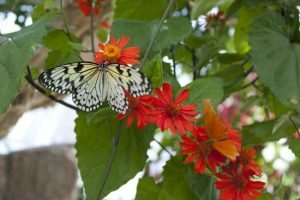 Visit Niagara Parks Butterfly Conservancy for a walk through a rainforest setting, viewing over 2000 butterflies. Did you know: The Niagara River supplies the water for the falls and its dissolved minerals and limestone create the green color you see? BlueLine Diner, 4424 Montrose Ave.: Huge, delicious pancakes, perfect bacon, wonderful coffee, and more. Bonus: Browse the hockey store attached to this diner. Flying Saucer, 6768 Lundy’s Ln. : Up late? Flying Saucer is open until 4 am! Indulge in eggs, fries, toast, and more. Koutouki, 5745 Ferry St.: Chicken souvlaki, moussaka, lemon potatoes—great Greek fare. Fun fact: Niagara Falls State Park is the oldest state park in the nation. Piccadilly Restaurant, 5501 Ferry St.: Traditional English pub fare and the owners are from the UK. Great fish and chips and chicken curry. Weinkeller, 5633 Victoria St.: With fare such as house-made wine and fried goat cheese, Weinkiller is upscale and farm-to-table. Frijoles Fresh Mex Burritos, 3465 Portage Way: Open until 8 pm, this burrito establishment makes everything in house, including all the sauces. Customize your order any way you like. Vegan and vegetarian options. Tide & Vine, 3491 Portage Rd. or 1523 Niagara Stone Rd. : The freshest oysters and great seafood. Serves local beer and wine. PhoXyclo, 6175 Dunn St.: You can get a great steaming bowl of pho here, with an sweetness to the broth. Queen Charlotte Tea Room, 5689 Main St.: The desserts are made from scratch, and tea is always ready. You can also feast on bangers & mash, mushy peas, and fish & chips. AG, 5195 Magdalen Ave., Named for silver on the periodic table, this farm-to-table experience is sophisticated, made with fresh ingredients harvested from the AG farm. Good to know: U.S. driver’s licenses are valid in Canada, but if you’re visiting from other countries, you’ll need an international driver’s license. A seatbelt must be worn at all times, for both drivers AND passengers. Hand-held electronic devices are banned while driving. Discover more to explore from our Niagara Falls Pinterest board and begin planning your TapRooT® trip today.